Santa Claus wooden Christmas tree decoration. Santa is shown holding a Christmas quilt. 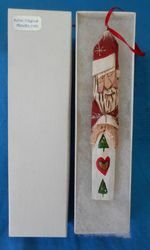 Individually handcrafted and a great gift idea for the christmas stocking.